High Peaks Pure Earth presents a guest post by Thubten Samphel*. The guest post is a book review of “Yak Horns”, the most recent publication by Tibetan writer Bhuchung D. Sonam. This new Book Reviews section on High Peaks Pure Earth is a place where we will publish reviews of writings by Tibetans which are also relevant to this site. “Yak Horns” was officially launched in Dharamsala in July 2012 and is a book of essays and commentaries on writings, music and film from Tibet. Many of the writers and works that feature in it can also be found on High Peaks Pure Earth, for example, Woeser, Jamyang Kyi, Kunga Tsayang and Tashi Rabten. There is also an essay about Red Songs that complements our own post about Chinese propaganda songs about Tibet. Our thanks to both Bhuchung D. Sonam and Thubten Samphel for permission to publish this review. 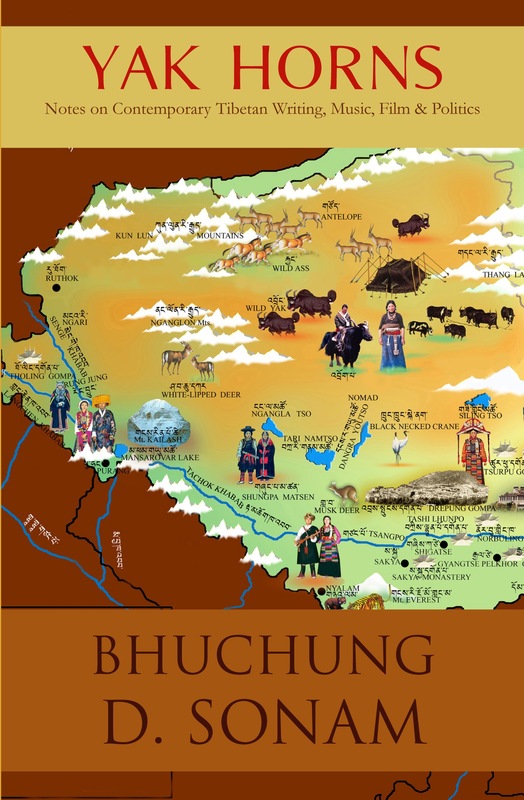 Keep up with Bhuchung D. Sonam on his blog “Burning Tibet”. Surprising things happen when cultures meet or collide. The best examples are India and China. Both confronted Western powers. India suffered British colonial rule for more than 200 years. China, though nominally sovereign, was bullied and humiliated by the West and, the worst of all, invaded by the Japanese. How differently the two countries reacted to this common challenge tells a lot about the outlook of their two cultures. India took everything its colonial master had to offer, language, rule of law, bureaucracy and justice it practised at home but not in its vast colonial empire. Now India is a mature, stable democracy with the highest level of press freedom in Asia. China too wanted a similar destiny for itself. At the beginning when the Middle Kingdom grappled with the rising power of the West, it looked to two gentlemen, Mr. Science and Mr. Democracy, as its saviour. Today China has got a lot of Mr. Science to the extent that it is now even in a space race with America, the home of scientific innovation. Though a section of Chinese society continues to look to Mr. Democracy to save China from itself, powerful vested interests within the ruling communist elite think this is not a good idea. They believe correctly that the torch of democracy and freedom might shine an unkindly light on their dark deeds. For this reason, even after more than 200 years of being confronted with the Western challenge, China has yet to find its balance and the Chinese have yet to decide what kind of people they want to be. In the same way in its long history Tibet faced two cultural challenges. One was when in the process of creating an empire the Tibetans confronted cultures and ways of life far removed from and far more sophisticated than the way of life they led on the plateau. They came in contact with cultures of Tang China, Buddhist India, the Persian Empire and the cultural influences of Greece in the Hellenized satrapies of Bactria and Sogdiana. With such a variety of cultural offerings on their imperial plate, why did the Tibetan kings decide Buddhism was made for Tibet? But once the Tibetans decided Buddhism was meant for them, there was no turning back. They embraced Buddhism with a fervour and vigour that stirs admiration and reverence in equal measure. Buddhism transformed Tibet and provided it with its timeless appeal. 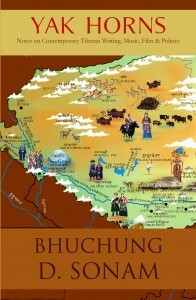 The second transformative experience of the Tibetan people is the theme of Bhuchung D. Sonam’s refreshing and comprehensive book which examines with deep knowledge and fine sensitivity the longings and musings of a new generation of Tibetan writers, poets, film-makers and artists on both sides of the Himalayan divide. Those in exile meditate on their stolen permanent address. Those in Tibet agonise about their stolen soul, or in Woeser’s case, her stolen passport and all it implies. Yak Horns is a welcome new addition to the growing body of writing and poetry by young Tibetans both in Tibet and exile contemplating the sad fate of their country. The canvas of Yak Horns is vast, peopled with personalities drawn from history and from our own times, who through their writings and meditations have enriched Tibet and expanded the scope of its culture and literary traditions. In making his canvas large by bringing in Tibetans from history, from the other side of the Himalayas and from all fields of endeavour that excite and spark their creative fire, Bhuchung Sonam has rendered inestimable service to the Tibetan people and their struggle. His essays on the writers in Tibet, risking their lives and limbs, will inspire generations of Tibetans who will come to admire their courage and be grateful for their sacrifice. Their writings are an effective form of resistance against assimilation and being swallowed up in the Chinese mainstream. They assert their pride in Tibetan identity in the face of ‘modernization’ imposed on them with an iron fist and their villages and towns transformed into so many Chinatowns. This is the pledge I make to my fellow Tibetans. The creative spark these courageous writers and bloggers have ignited will be a lamp for coming generation of Tibetans as they negotiate the treacherous path between modernity and tradition, occupation and freedom, unfettered development and sustainable growth. Well-informed Tibetan scholars are already talking about the flowering of an intellectual and cultural renaissance in occupied Tibet. 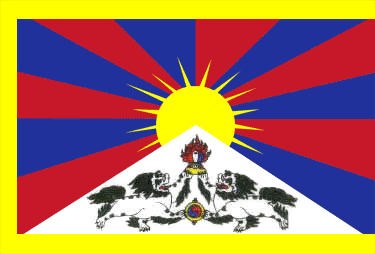 The essence of this renewal and awakening is the proud assertion of Tibetan identity. This assertion comes in the wake of Tibet’s bitter experience, past and present, at the hands of the Chinese authorities. It is no wonder that increasing number of young Tibetans in Tibet are setting themselves on fire. They see their land, their jobs and their very future snatched away by Chinese settlers who in Tibet behave like any brash colonizers, their behaviour emboldened by a strong state and a stronger army. In this way, the Tibetan exiles have decided what kind of people and culture they want to be. Their decision will be shared by those in Tibet who long for freedom and their beloved leader, who happens to be accessible to millions around the world but not to them, back home. Bhuchung Sonam’s interests are wide-ranging: from writing to poetry, to music, films and politics. On this big canvas he’s drawn all the personalities who keep the industry of Tibetan cultural and political life running, busy and hugely productive. In doing so, the writer brings to life, with great empathy and clarity, the passions and interests of young Tibetan writers, singers, poets, film-makers, activists and leaders who have broadened the horizon of the Tibetan people. For this, generations of Tibetans, down the long and lonely road, will remain grateful and find inspiration as they too begin their trek towards the vision of Tibet they hold sacred in their hearts. * Thubten Samphel is the director of the Tibet Policy Institute, a think tank of the Central Tibetan Administration. The views expressed here are his own. They do not reflect those of the Central Tibetan Administration. Excellent review – as erudite as it is heartfelt, fully worthy of the writer and the book. Respected Mr. Sampel la has written beautiful review on YAK HORNS by Bhuchung La. Thanks to both of them. Good review of the book that needs and must be read by all young Tibetans everywhere. Yak Horns also needs to talked about and discussed amongst us so that we can find our own voice.